The Vulturine Guineafowl is the largest species of Guineafowl and is excellently adapted to living in dry African regions, being able to live for a long time without water, obtaining all the necessary fluid from its food. 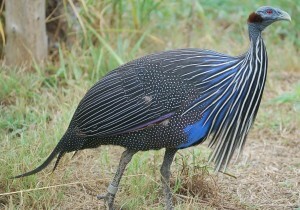 The name “Guineafowl” indicates that these species come from the Gulf of Guinea. 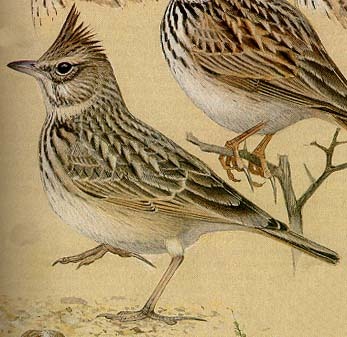 These birds reach a size of 46-62 cm with 28-32 cm long tail. They are the most spectacular species of Guineafowl – the plumage is bright cobalt blue, with a mix of violet, black and white. The bird has obtained its name because of the neck and head, which being bare remind of a vulture. They inhabit bushy half-deserts in Ethiopia, Somalia and Kenya, as well as Uganda and Tanzania. Vulturine Guineafowls are social birds that mostly live in large groups. They are able to live in dry, bushy plains where water is scarce, while the vegetation mostly consists of acacia bushes. 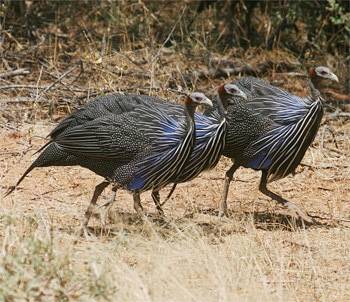 When the environment becomes too dry, these birds move to forests, where they share the territory with other Guineafowl species. 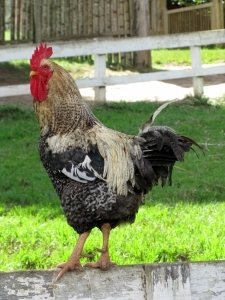 Like most land-dwelling birds, they prefer walking instead of flying and even when in danger, will almost always rely on their muscular legs to take them to safety. That, however, doesn’t mean they can fly – in extreme cases they can fly a distance of up to 500 metres. In the evening, they fly to sleeping spots, which are usually in a tree surrounded by thick bushes. At dawn, Vulturine Guineafowls leave their resting places and go to feeding areas. Up until noon, the group consisting of 20-30 birds searches bushes and the ground for vegetation. When the heat becomes extreme, they rest in the thick bushes. After a few hours, they resume feeding on seeds, grass, sprouts, roots, and sometimes bugs, spiders, scorpions and snails. 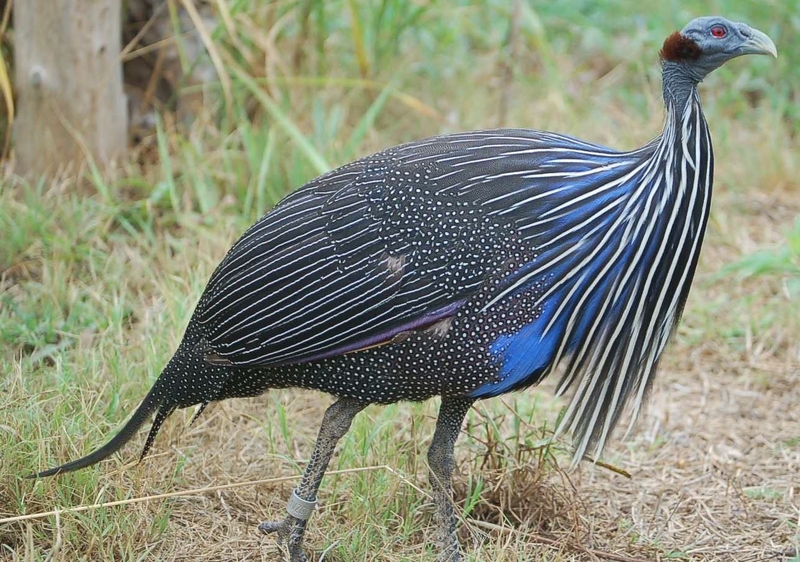 Vulturine Guineafowls can almost completely live without a freshwater source, obtaining the necessary water from plants and animals they eat, as well as morning dew. Annual rains indicate the beginning of the mating period for these birds. 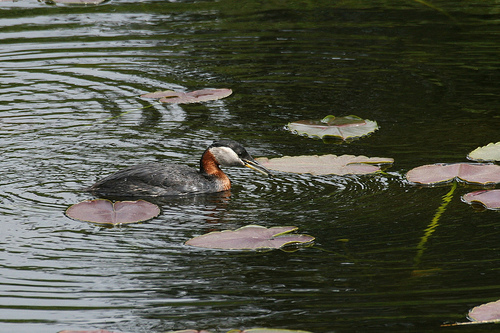 The culmination is usually June, although these birds can mate at any time of the year. During this time, the lareg group is divided in pairs, who nest together. The rut is initiated by the male, who displays his beautiful plumage, in an attempt to attract a female. After a successful copulation, the female lays 8-15 eggs in a shallow hole in the ground. The female incubates the eggs for 23-28 days and the hatchlings quickly leave the nest, although the father keeps feeding them for a few days. They can fly two weeks after hatching. Vulturine Guineafowls are being hunted for their meat, but they have also been introduced to many bird houses in Europe and North America, because they can easily adapt to any conditions and their spectacular plumage attracts many visitors. Currently, this species is not endangered.